Las Vegas bills itself as ‘the entertainment capitol of the world. Over the years, the Vegas world class hotels have presented legendary stars headlining the Sunset Strip. In our newest cabaret show, we pay homage to these giants of the entertainment world. 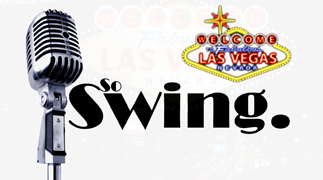 With their inimitable style, the SO SWING singers celebrate the great artistes who have famously performed in Las Vegas as they bring the legends to life at your event. From Barry Manilow to Tom Jones, Bette Midler to Barbra Streisand, Sinatra to The King - Elvis Presley, SO SWING entertain with an array of their most famous hits. What better entertainment for your Vegas themed event? Songs include: ‘Viva Las Vegas’, ‘Copacabana’, ‘It’s not unusual’, River deep mountain high’, ‘Too good to be true’ and many more. The show features three fabulous vocalists (two males, one female), and can be performed to fully engineered backing track or accompanied by the fabulous SO SWING trio. If you would like to add an extra bit of glamour, the show is available with two showgirl dancers. "SO SWING IN VEGAS has always sold out well in advance. It is a very classy act and well performed."